The following are recipes that were either part of our regular meal repertoire or things that I came up with when we had to seriously cut back on salt. I am sure I will add more items as I think of them or as people ask. For baked goods, I generally reduce the amount of salt called for without too much sacrifice to the rise factor. For fun fast food that it was too hard for us to give up entirely, like pizza or nachos, I either baked the pizza crust myself and stayed away from saltier toppings like olives or sausages and found no-salt tortilla chips and low-sodium salsas and canned tomatoes for homemade sauces. Once you add salsa and cheese your nachos really are plenty salty. The health food markets also have natural lines of Asian Sauces (Hoisin and Oyster to name two) that are much lower in sodium than the more mainstream brands available. This makes stir fry’s and Asian soups much less of a high-sodium hazard. Mix all ingredients together by shaking in a jar or storage container. It keeps well in the refrigerator and is very tasty on broccoli slaw or baby greens. For broccoli slaw, I add slivered almonds, craisins, about 1/3 cup of the above dressing and let marinate for a few hours before serving. Great for dinner, it freezes and reheats well. The sodium content will only be what’s found in the brand of stock you’re using, the dairy items, and bread round, if used. In advance: Cut the top off the head of garlic. Wrap in foil and drizzle with olive oil. Seal foil and bake the garlic at 350 degrees F. for 55-60 minutes in toaster oven or conventional oven. Using the central, mostly white part of the leek, slice each stalk lengthwise and wash carefully to remove any grit and dirt. Slice cleaned leeks into ¼ – ½ inch slices. In medium sized saucepan, preferably one with a heavy bottom, heat the olive oil. 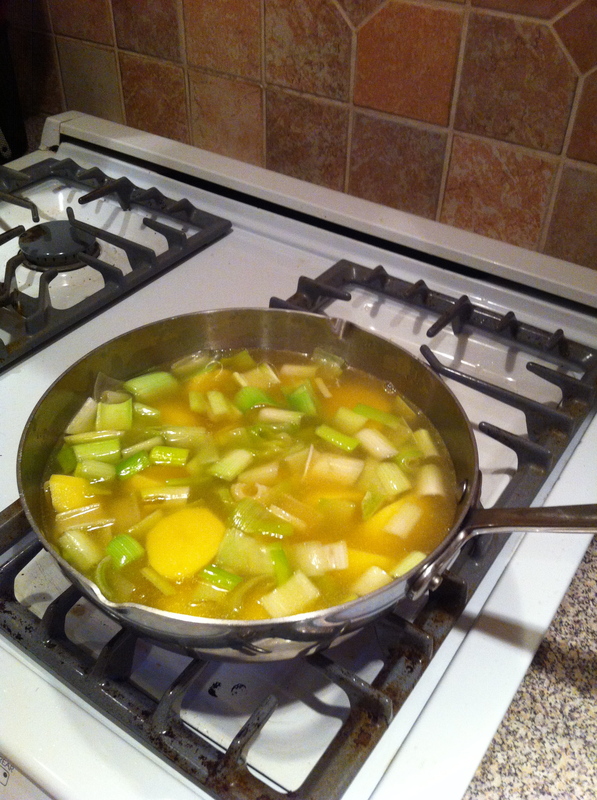 When oil starts to shimmer, add the leeks and stir cook for 30 seconds. Add Marsala and stir briefly, another 20-30 seconds. Add potatoes and enough stock to cover, there will be some stock left over. Bring stock up to boil then reduce heat to medium. Add the roasted garlic to soup, squeezing it out of the clove skins into a separate bowl first, watching for shreds of paper. Cook, covered, until potatoes are tender, about 25 minutes. Take soup off heat and, using a stick blender, blend the ingredients until there are no chunks of potato or leek, adding a small amount of whole milk to help consistency. 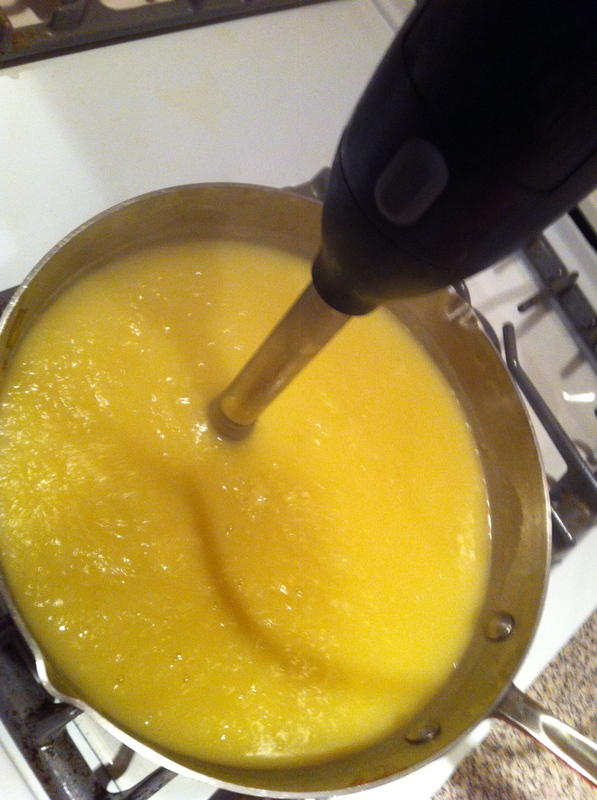 (Don’t add milk if you plan to serve it the next day or freeze it. Milk can be added when it’s reheated.) Season with pepper and a little salt. Put soup back on burner and heat through before serving. Serve with toasted baguette slice and shredded cheddar cheese, or a dollop of crème fraiche. Place the cleaned and cut up chicken in a dutch oven or other heavy bottomed pot. Cover with about ten cups of water or at least enough to fully cover the bird. Heat and skim off bubbles and scum that rise to the top. This phase should take 35-45 minutes. Add the prepared root vegetables to the pot and cook on medium-low heat for another hour. If you plan to use pieces of breast meat in the soup, you should take out one of the breasts and reserve it for later use. Turn off the heat and let the soup cool down for about twenty minutes. Using a strainer tough enough to hold the solid ingredients, pour the contents of the pot through the strainer and into a large mixing bowl. Discard the cooked chicken and vegetables and strain the broth again. When the stock is cool enough to store, place in airtight storage container. It can keep in the refrigerator for 3 days or in the freezer for several months. To make chicken soup from the stock: Reheat the chicken stock, adding half a diced onion and 2-3 sliced carrots. Also add bite sized pieces of the breast meat you reserved and noodles. Noodles should be cooked in a separate pot and added when the soup is served. *About the chicken: I usually by a whole bird, cut it up and decide to get one meal from either the breasts or leg quarters then make stock from the rest of the bird. You can, of course, use the whole bird and not cut it up in advance. I no longer buy boneless breasts but if I’m cutting the chicken off the bone I might save the bones and start a stock bag in the freezer. Some markets sell backs for making stock, also. 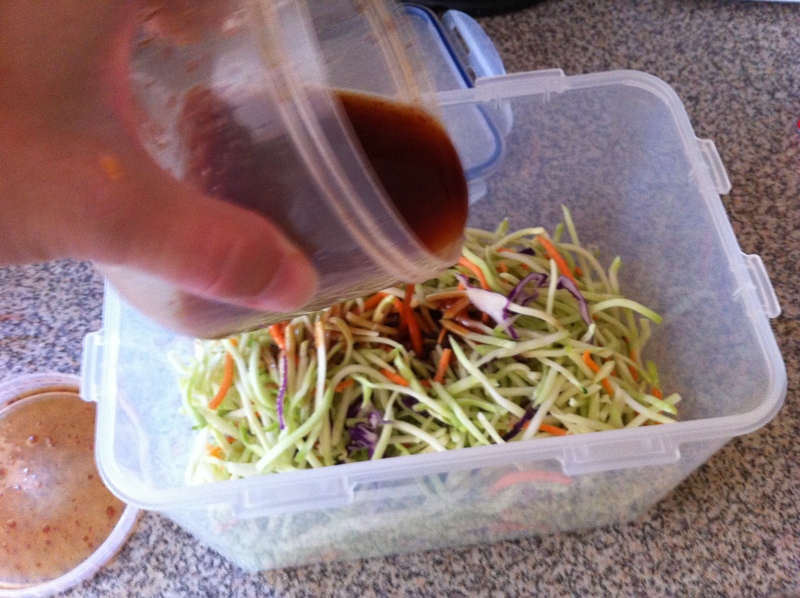 Prep the vegetables and combine in a plastic storage container with a fitted lid. 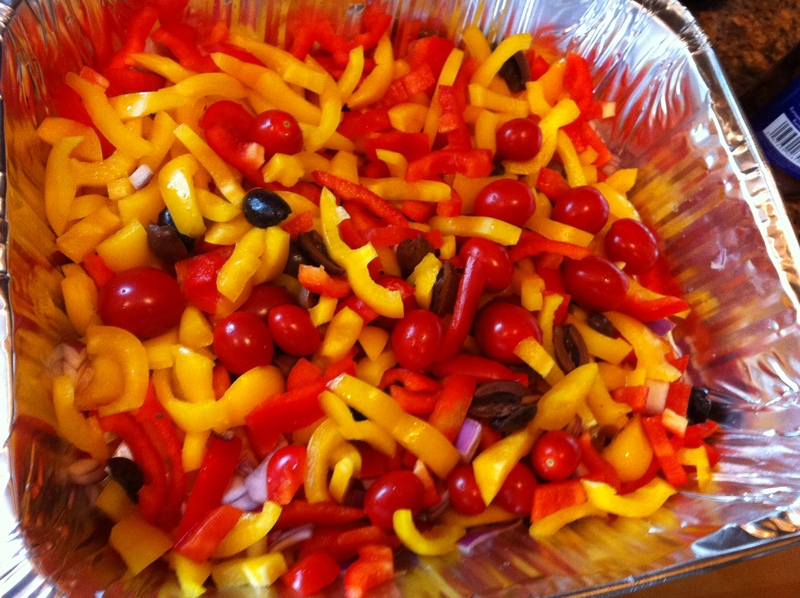 Add the cheese, olives and salad dressing. Close the container and gently shake. Marinate in refrigerator for a few hours and serve. It will last 3-4 days in the fridge.